Our Technology Bulletin Board Ideas page will provide you with great resources for a number of technology related topics. Our bulletin boards will help you integrate various activities into your daily curriculum. Ideas within the technology bulletin board pages include resources for the following: computer hardware, computer software, and internet safety. Using CDrom images (die cuts) and computer/technology border, strategically place short captions of what your school or school system is doing to improve students' and teachers' technology education. "Watch out for falling spam"
I then took the cute funny cars and added them above the computers for my Kindergarten class. I put their name on the cars so they knew where to sit. It also helped me learn their names. I created a 3-D "Technology Tree" out of scrunched and rolled up brown butcher paper. Then I added old CD's and new ones from the mail (like AOL) and dangled the CD's from the branches using clear sewing thread. I change the color of the leaves depending on the season. The student love how the CD's sparkle and twist in the air. BE WISE.....Watch Out For Computer "BUGS"
I have an idea I use for my October bulletin board. We study about computer viruses in October. I make up this bulletin board: BE WISE.....Watch Out For Computer "BUGS". I make a large picture of a computer that has a sick look on it's "face." I make a thermometer and put it in the computer's mouth, an ice pack on the computer head. I make "bugs" and make them look like they are crawling all around the computer...making it sick. Information is posted all on the board explaining how computers get a virus, how to protect a system from viruses. We also talk about viruses, what causes them, how to protect our system from viruses. 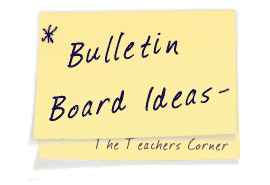 Please use the link at the top of the page to send us your technology bulletin board ideas!